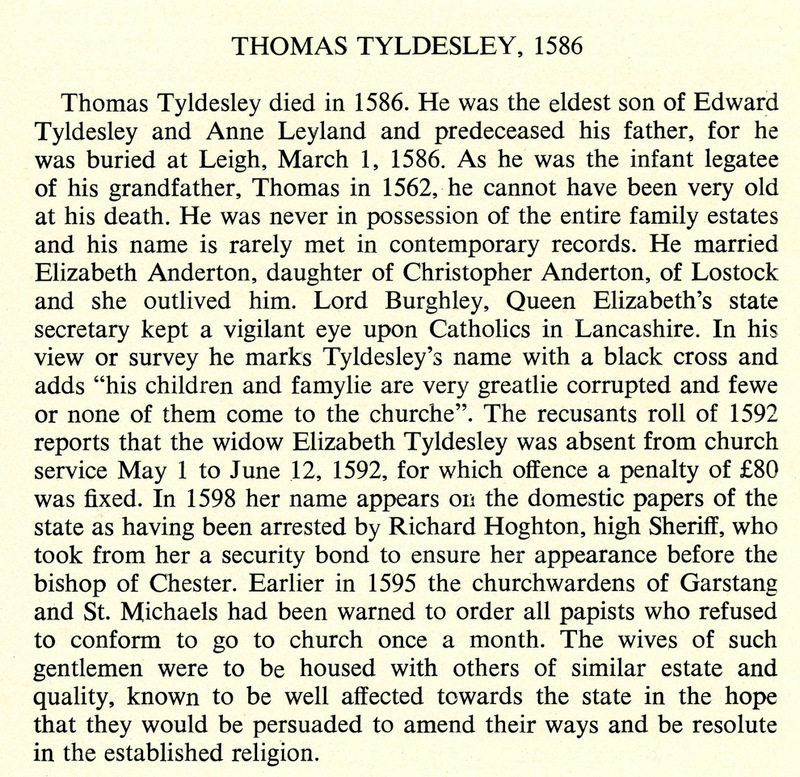 Thomas Tyldesley died in 1586. He was the eldest son of Edward Tyldesley and Anne Leyland and predeceased his father, for he was buried at Leigh, March 1, 1586. As he was the infant legatee of his grandfather, Thomas in 1562, he cannot have been very old at his death. He was never in possession of the entire family estates and his name is rarely met in contemporary records. He married Elizabeth Anderton, daughter of Christopher Anderton, of Lostock and she outlived him. Lord Burghley, Queen Elizabeth's state secretary kept a vigilant eye upon Catholics in Lancashire. In his view or survey he marks Tyldesley's name with a black cross and adds "his children and famylie are very greatlie corrupted and fewe or none of them come to the churche". 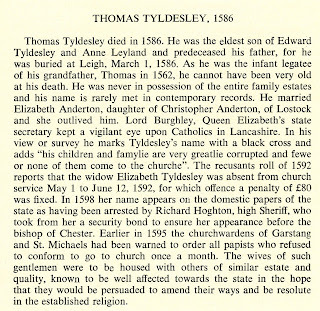 The recusants roll of 1592 reports that the widow Elizabeth Tyldesley was absent from church service May 1 to June 12, 1592, for which offence a penalty of £80 was fixed. In 1598 her name appears on the domestic papers of the state as having been arrested by Richard Hoghton, high Sheriff, who took from her a security bond to ensure her appearance before the bishop of Chester. Earlier in 1595 the churchwardens of Garstang and St. Michaels had been warned to order all papists who refused to conform to go to church once a month. The wives of such gentlemen were to be housed with others of similar estate and quality, known to be well affected towards the state in the hope that they would be persuaded to amend their ways and be resolute in the established religion.